You are working nonstop. You rush around, always on the go. You spend hours a day catching up on emails. You send “just a few quick messages” via your phone at lunch. And of course your laptop is always at your side. You hardly see your children on weekdays, and regular exercise has become a fantasy. But despite working 24/7 you feel that something is just not right. You are still not achieving the results you desire. You are lacking a sense of fulfillment. You wonder how you can squeeze out more hours of the day to finally get where you want to be. 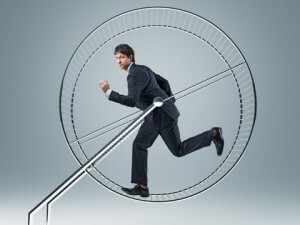 Let me tell you one thing: spinning your hamster wheel faster will not get you anywhere! It’s time for you to jump off the hamster wheel. Now. Step back for a moment and take inventory. Albert Einstein said “Doing the same thing over and over again and expecting different results is insanity.” So if spinning the hamster wheel has not brought you where you want to be, it won’t get you there in the future either. It is time for you to do things differently. Or to do different things. A typical symptom today is that organizations and the people in it fall short of realizing their full potential, thus failing to achieve sustainable success. Through my years as an executive and now an executive coach I have noticed there are mainly two diseases causing these symptoms: mission issues and people issues. Direction, Focus, and Execution are key factors on the mission and tasks side for sustainable organizational success. Has your company set up a clear (and I mean clear) direction of where they want to be? And if so, is the whole organization aligned in that direction? Do your organizational priorities change on a daily basis? Staying focused on the top priorities will be much more effective and efficient than running after every new “shiny ball” that appears. Execution: Knowing what to do is not enough. You need to do what you know. Too many meetings, too many emails, and being busy being busy will not get you to where you want to be. Work smart, not hard. Referring to Belbin’s team roles, does your company have enough implementers and completer-finishers? The idea of “using up” people makes me shiver. Recruitment: Your organization’s success depends on having the right people at the right place. Obviously this starts with getting the right people on board. But while busy with being busy, people do not spend enough time in attracting and choosing the best people. How much time do you and other senior managers invest in this most important business process? Development: once you have made sure you have the right people on board, the investment must continue. Training and development is not a luxury or an incentive. It’s a necessity not only for organizational excellence but moreover for your organization’s survival in the long run. How does your organization support the development of people who devote a great deal of their life time working for this organization? Motivation: Alas, latest since Daniel H. Pink’s “Drive” we should know about the importance of autonomy, mastery, and purpose for a person’s motivation, right? Of course your company provides room for all three so that people excel, don’t they? If you are still applying the carrot and stick model in the year 2011 do not be surprised if your company fails to succeed. Communication: Communication is crucial. From romantic relationships to the work place. And even though we all have learned this in our first leadership seminar, it seems so difficult to apply simple rules of active listening or convincing people in daily life. Is communication in your organisation mono- or bi-directional? Do people take into account the need of different personality types e.g. according to MBTI types? Jumping off the hamster wheel doesn’t have to be hard or complicated. The world won’t fall apart if you put down your phone, and close your laptop. The main point to remember for both you and your organization is that people need to be valued as people and not machines or assets. And “people” includes you as well. Focusing on your people as people and on a unified organizational direction will ultimately lead to the type of sustainable execution you and your organization are looking for.